Supermicro has a proven record providing superior time to market technology to customers throughout the world with system Integration facilities strategically located in US, EMEA and APAC. From high availability storage servers to complex fully configured Big Data solutions, Supermicro can take your business to the next level. Supermicro's Virtual SAN (VSAN) Ready Nodes focus on deploying VMware® Virtual SAN™, a hypervisorconverged solution, as quickly as possible. Virtual SAN provides you with the ability to provision and manage compute, network and storage resources from a single pane of management. Working with VMware, Supermicro delivers an alternative to traditional Fiber Channel SAN based virtualization infrastructure, which is known for its complexity and interoperability challenges. Targeted at a multitude of use cases in tier 1/2 production workloads and Virtualized Desktop Infrastructure (VDI), especially with all flash deployments, Supermicro's VSAN Ready Nodes introduce a new high performance storage tier optimized for enterprise-class virtual environments that is simple, resilient and efficient that reduces the total cost of ownership. It is a perfect solution for Enterprises ROBO and SMBs to efficiently grow and manage virtualized infrastructure for maximum ROI. Each configuration profile provides a differentiated price/performance focus, targeting multiple use case requirements. Each profile assumes a target number of Virtual Machines per node, utilizing an average Virtual Machine profile size. Fault tolerance is built into the solution with data replication between nodes, and clustering technology. Flash and hard disks are seamlessly integrated to achieve best balance in performance and capacity. Single bundle for procurement - Supermicro VSAN Ready Node comes with the appropriate licenses for vSphere and Virtual SAN. Supermicro production and service works with customer to simplify the setup experience. 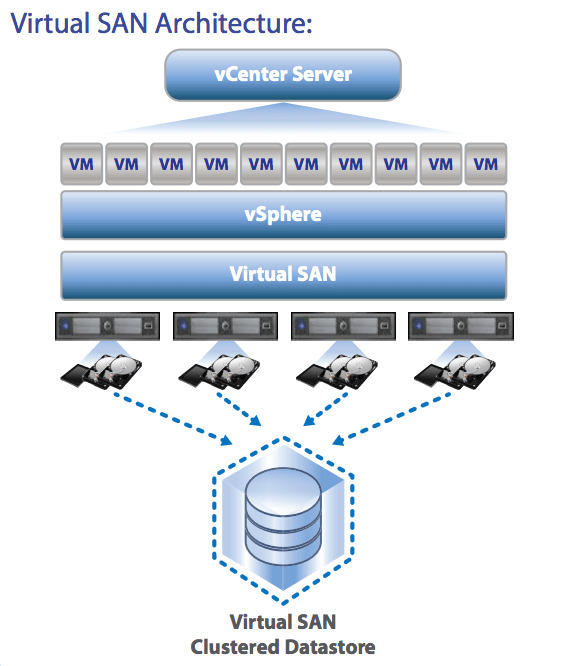 Radically Simple Storage - VSAN integrates seamlessly with vSphere platform for storage tasks. Storage provisioning and management is a breeze. VSAN automatically rebuilds and rebalances storage to maintain Quality of Service from the storage resource. Lower TCO by up to 50% - VSAN allows you to granularly scale-out you storage environment to allow for growth while eliminating overprovisioning. High Performance - VSAN has integrated server-side flash to provide read/write caching, providing lower latency and better throughput than external flash appliances and devices. As a result, VMs and applications have the most optimized I/O data path to support your business demands. Fault Tolerance - VSAN uses distributed RAID and cache mirroring to ensure that data is never lost in case of disk, host or network failures. Combined with Supermicro’s legendary quality and reliability aids in enhancing system uptime and ensuring business continuity. Peace of Mind - Supermicro VSAN Ready Nodes are jointly recommended with VMware. Full system delivery ensures compatibility and maximizes the success of implementation. OpenStack is the proven Open Cloud Platform being adopted by Service Providers and Enterprise Private Clouds enabling large scale production-ready clouds that accelerate innovation and drive down the Total Cost of Ownership (TCO) for cloud solutions. Supermicro has partnered with the leading OpenStack software firms to jointly-engineer total solutions for OpenStack. These solutions are built on best-in-class Supermicro Server and Storage systems that deliver broad platform choice, fast to market innovation and optimized for value, performance and efficiency. The storage landscape is evolving from premium priced proprietary hardware and software solutions to open industry standard hardware and the benefits are significant: reduced vendor lock-in, significantly open innovation with new technologies like all NVMe solutions. 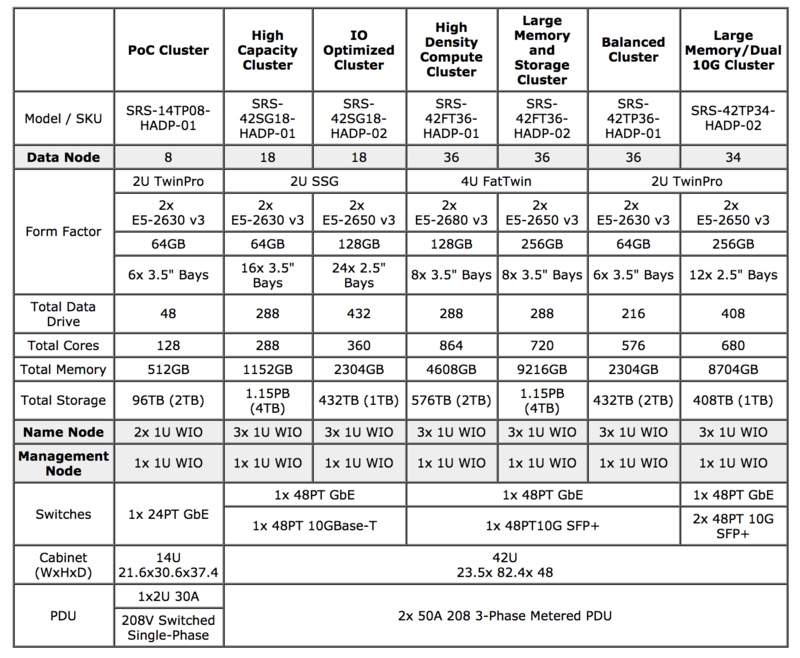 Supermicro's extensive storage platform of choice for leading storage vendors and major hyperscale datacenters. Includes full cluster customization, burn-in and testing, BIOS and Firmware updates, network configurations, pre-install of the Hadoop distributions of choice, including Cloudera and Hortonworks.